Dec. 6, 2017 8:40 p.m. The words came from Olivia Hofter, chairperson of the Central Okanagan Women’s Resource and Education Foundation, speaking at the annual candlelight vigil, held Wednesday, Dec. 6 in Kelowna, as part of National Day of Remembrance and Action to End Violence Against Women. More than 80 roses were placed at The Sails to honour women who were victims of violence. The list started with about 20 names including the women killed in the Montreal massacre, and has since grown to include about 80 names, most of which are local. In 1989, 14 women were killed at École Polytechnique in Quebec, making it the deadliest mass shooting in Canadian history. Carol Taylor honoured the memory of the women, who were primarily engineering students, with a candle and rose. Sharon Currie attended the vigil with her friend and believes the issue is coming out into the open. Currie saw an ad to end violence against women, which shows men in varying stages of their lives, highlighting that violence is unacceptable at every stage. 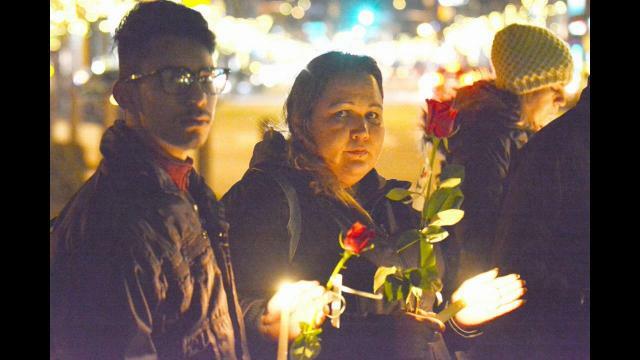 Olive Davis is a survivor of domestic abuse, and held a candle and a rose during the vigil. “It’s empowering to know that there’s people out there that do stuff like this, I know when I was in that moment I felt very alone,” she said. The candlelight vigil has been ongoing in Kelowna since 1990, according to event organizer Micki Materi, of the foundation. “I don’t think the issue is changing, but I think as a society we are more aware,” said Materi. “In the ’90s when we started doing this generally if neighbours heard something next door they minded their own business because it was a family matter. Only the victims names are broadcast during the vigil, not the perpetrators. “I think we’re pretty good at the remembrance piece… the next piece of it that we cannot forget is the action piece and that is where we sometimes fall short. I want you to think of what you can do on an individual level to work to end violence,” said Hofter to the crowd of around 80 people. A vigil was also held Wednesday at UBCO.